Are we living in the future or what? 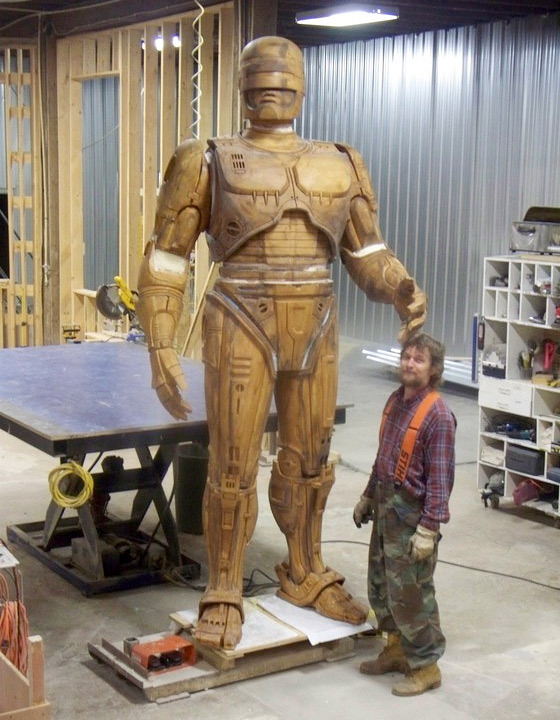 Last year there was a big discussion about the development, planning and installation of a massive RoboCop statue of the cinema hero that would be placed in Detroit, the city where the original film takes place. Somehow they got approval and development continued. I can't wait to see this thing installed. Until then, The Verge has found a Kickstarter for the completion of the statue and it features photos of the 10 foot tall prototype they've built (that will eventually be bronzed). This thing looks awesome already. And I can't believe it really exists. May I get two of these to adorn my front porch, please? "There's really nothing to say. Just take a look at RoboCop in his 10-foot-tall pixel-atom-perfect glory." Click on any of the photos above for the Kickstarter page and updates. 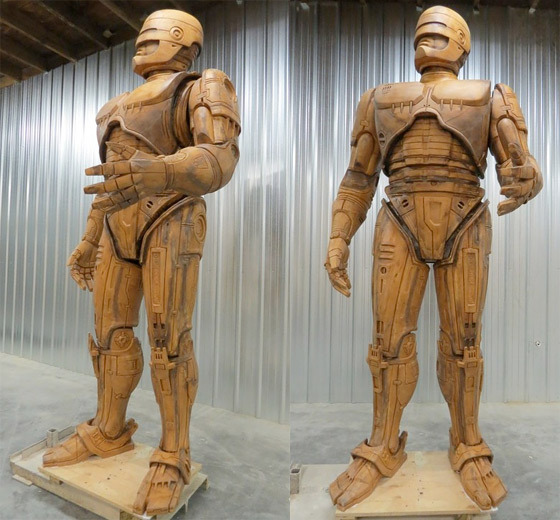 This RoboCop statue prototype seen above was created by enlarging a 3D scan of a smaller model and manufacturing the pieces out of foam, wax, clay and steel. Up next, "he's headed to Venus Bronze Works in Detroit for casting and manufacturing in bronze… He's not done yet, but what you're seeing in these pictures is pretty much exactly how he'll look." So cool. The actual placement of the statue hasn't been decided yet, as there has been an endless debate over locations in Detroit. Either way, this is great to see coming along, and though it's a bit different from our usual news it was definitely worth stumbling across. For more see Kickstarter or detroitneedsrobocop.com. To me, this feels like a giant middle finger to the remake disguised as an awesome statue! Yes! I want that in my house! Guess I now have a reason to go back to Detroit. Maybe he will thwart crime? That is the most wonderfully ironic and iconic symbol of exactly what has happened to Michigan since Gov. Snyder turned it into a totalitarian state under the 'emergency manager laws'. Wonderful! A testament to not only Paul Verhoeven's superb movie, but Rob Bottin's fantastic costume design. I can hear Basil Poledouris' music playing in my head as I look at those photos.